Review: 2012-08-11, close fight with one knockdown and some good shots but this second fight between Benson Henderson and Frankie Edgar has not been very exciting: two stars. 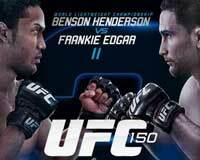 Benson Henderson (16-2-0) entered as the No.1 lightweight in the world while Frankie Edgar (14-2-1) entered as the No.2. Henderson vs Edgar 2 is valid for the UFC Lightweight title (Henderson’s first defense); in their first fight Henderson defeated Edgar by unanimous decision (February 25, 2012). Watch the video!